Today is one of my least favorite days of the year - the first work day after Daylight Savings Time ends, the beginning of 'Driving Home and Walking the Dogs in the Dark' season. With less light and soon-to-be colder temperatures, our training and exercise routines will have to be adjusted accordingly. Another downside is fewer opportunities for good pictures. Here we are ready to venture out into the night above. I need a head lamp. On the positive side - The Ginger Sisters probably get more training during the cold months. Shorter walks necessitate creativity and novel, engaging indoor activities. I spend more time on Ruby's trick training while Boca works on puzzle toys and manners. Both girls enjoy rowdy games of tug with me and with each other. This winter I'd like to attempt one of the tricks that has been eluding us, like Ruby putting her toys away. Since Boca doesn't enjoy trick training for the sake of trick training like Ruby does, our goals are more practical. With her propensity to seek out discarded chicken bones and other gross and dangerous items, improvement on "leave it" is at the top of the list for the former street dog. Dogs need mental stimulation as much or possibly more than straight physical exercise, but they also have different styles of learning and different ideal states for learning. For the best training results with Ruby, I have to catch her in that sweet spot between sleepy and riled up. She is generally too excited to train if she hasn't had her morning or evening walk beforehand, and during her napping hours of 1 p.m. to 4 p.m. training doesn't interest her. Boca is game as long as food as involved. 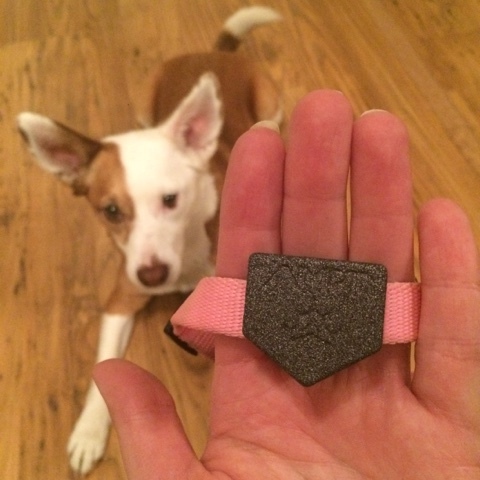 As someone who loves lists, goals and patterns, I'm very excited to have been offered the chance to try out a new dog activity monitor forthcoming from AMPT Animal. 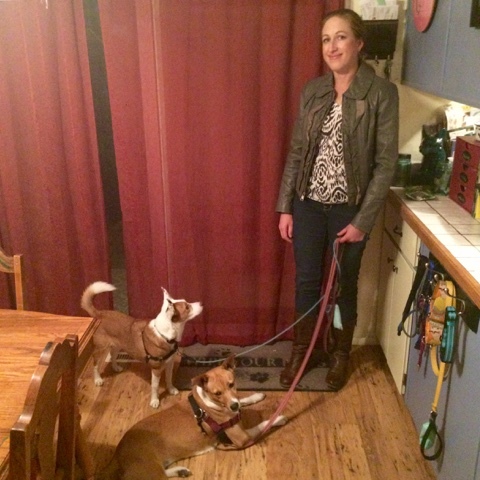 Ruby is pictured above wearing the prototype, which is a nice size even for small dogs. It slips on securely to any standard, flat collar. The monitor tracks your dog's activity, distance traveled, and the app allows for setting different training and exercise goals. I think it would be a great way to ensure that you are meeting your dog's needs throughout the year. The feature I'm most excited about is the remote on-collar "clicker" controlled with your mobile device. 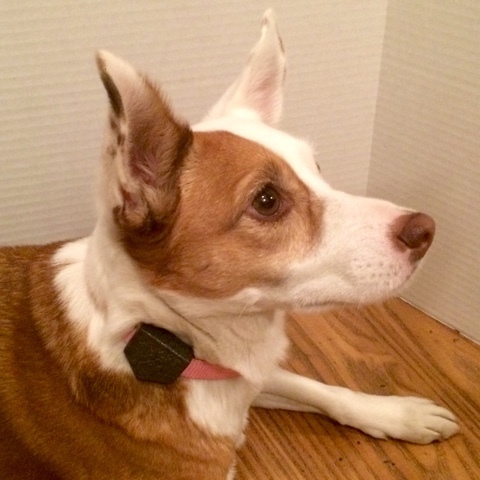 I am curious to see if a sensitive dog like Ruby will accept this sound from her collar, and think it's a brilliant idea - we might not always have a clicker on-hand, but most of us carry our phones everywhere we go. 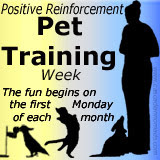 This post is part of the Positive Pet Training Blog Hop, hosted by Cascadian Nomads,Tenacious Little Terrier and Rubicon Days. This month's theme is Training and Exercise and the next hop begins on December 7th. The hop happens on the first Monday of every month, and is open for a full week - please join us in spreading the word about the rewards of positive training! Disclaimer: Rubicon Days has been offered a free AMPT Animal Monitor and no other compensation for this post. We only share products we believe in and AMPT Animal is not responsible for the content of this post. So glad I live in Arizona and have never had to adjust to the weirdness of daylight saving time! Blueberry has come a LONG way in learning leave it from when I first started training her last year. Yes, it has taken that long to fine tune it. Since it has cooled off significantly here, more people are riding their horses and we all know what fine things the horses leave on trails that Blueberry LOVES. She still loves them - but she also knows that finding horse apples on the trail means I will give her a treat if she can make it past them. I have to remember to bring more high value treats with me during this time of year because a plain old treat isn't worth more than a horse apple, apparently. I look forward to hearing how Boca does with her leave it command! "Road Apples" are irresistible to the canine set, but I recently l recently learned something really scary about them: horses that have been recently dewormed can shed the dewormer in toxic levels to dogs (especially those herding breeds with the MDR1 mutation). Even more reason to solidify that "leave it!" Oh yes - one of the reasons I worked extra hard on this was the horse apple she ate on one of our hikes and how sick she became about 5 minutes later. I wrote a post about it - it was really scary and since then, I no longer consider it a cute, harmless behavior. Generally, afternoons and evenings are better for training Mr. N. He likes sleeping in the mornings. We recently got a skateboard so that's going to be our long-term winter trick to work on. I'm really interested to hear how Ruby responds to the click. The idea of something going off on the dog's collar scares me a little. I agree...and really, if you have your phone in hand there is probably already a clicker app or a sound that approximates the clicker, but I think it's a cool added feature if you're using the monitor. I would definitely start off getting her used to the sound when not wearing the collar. I'm curious about the activity monitor - I've considered getting one for Laika because I'm truly interested in how much variation there is from day to day. I'm guessing there's some pretty big fluctuations. And I'm with you on the least favorite day of the year. I don't mind the cold, but I'll never be a fan of dark when you leave in the morning, dark when you come home. But as you mention it does spur more creativity, so it's definitely not all bad. Daylight savings is such a load of crap. I'm a morning person, I'll get up whether it's dark or not - but when it's pitch black out at 5:30pm I have to fight not to get into bed at 7pm. Brodie's also not a fan - he's turning into such a little old man. His rule is if it's dark outside, he should be asleep.